Deafening cheers from fans, bright red CF Tiger banners and a line that meant he was one step closer to his dream of winning State as senior Brandon Conrad crossed the finish line at the Rich Engel cross country meet on Sept. 20. Conrad went in to this year’s cross country season with one end goal, to win state. After missing his goal last year of placing in the top 15 in the state because of the flu, he now goes into every race with the mindset that he is going to win the race. “It’s a goal he’s talked to me about ever since he was a freshman, and I hope I can see him accomplish that this year,” senior teammate Jens Jorgensen said. Assistant coach and training partner Hiram Marquez said one of Conrad’s strengths is determination. “From the first time I talked to Brandon this year, he told me he wanted to be top in the state, and I believe that’s a big strength for him. He is driven and very competitive,” Marquez said. 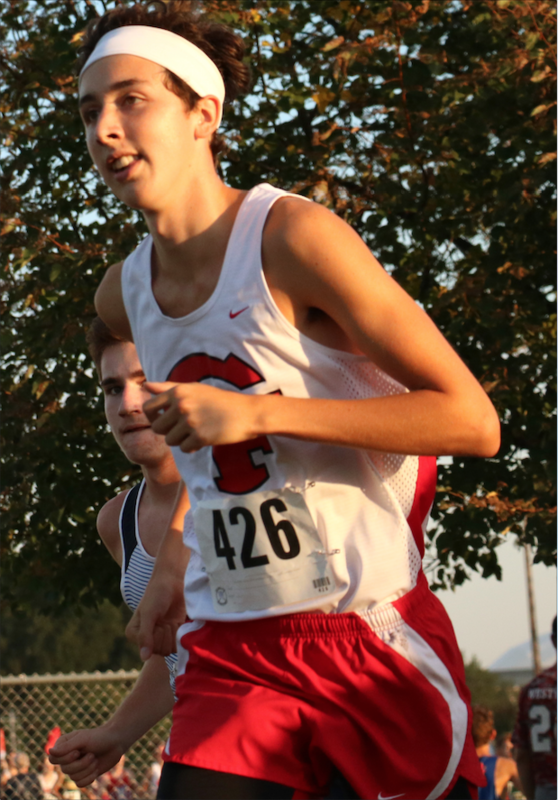 Conrad’s mentality has been successful in his races, as he is currently ranked seventh in the state and has placed first in the past two cross country meets, the Cedar Falls and the Dubuque meets. Conrad improved his time by 29 seconds at the Rich Engel meet this year. Last year he placed fourth with a time of 16.51, this year he placed first with a time of 16.22. Not only has Conrad’s mentality going into races led to his success this season, but his hard work during practice has also helped. “Beyond the ability he’s been blessed with, Brandon’s success is coming from a ton of hard work that he’s put in with his teammates over the last few years during summer, fall, winter and spring. 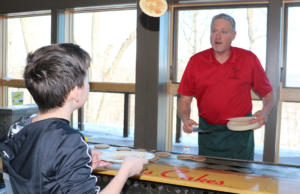 Day in and day out, miles and miles,” head coach Scott Gall said. Conrad has been faced with an unusual training season. He is the fastest guy on the cross country team, with none of the other runners in his pace range. Luckily, assistant coach Marquez, a former runner for Cedar Falls and UNI is willing to train with Conrad. “Just having someone to push me really helps out a lot. Since he has already been through college, he knows what he is doing. He’s worked really hard, so it’s like racing with one of the top guys in the state. Our workouts they get pretty tough, but I just make sure to stay in there with him and get it done,” Conrad said. “I run workouts with Brandon every Monday, and, man, are they starting to get tough. He’s actually been killing me the past few workouts, so I know he’s in very good shape,” Marquez said. Conrad’s teammates and coaches said his success is also due to his increase in confidence this year. “I believe his competitive spirit and confidence has made him successful these last two meets; he’s a fearless runner and is not afraid to go for it,” senior teammate Jens Jorgensen said. “Other than the fact that he’s like five inches taller, he’s a lot more confident in what he’s capable of doing. He’s always been a fast kid, but now he’s a fast kid that believes in himself,” Marquez said. Going into a race with a competitive field, he said he just has to fight through it and remember the competitor he is. “The start of the season they ranked me at 28th, and I see these kids beside me that I have beaten before, and when it starts to get tough, I know I have to fight through it to prove everybody wrong,” Conrad said.